The most important cog in the wheel of wine, is that consumer-thing. This sentient being is more difficult to read than a short-term insurance contract written in Urdu and its whims, wants and tastes are about as predictable as the outcome of a debate on fee-structures on the UCT campus. For work purposes I am, with great professionalism and attention to detail, going through some confidential market research on eating patterns of millennials and other economically active South Africans. And I tell you, the love of things sweet is frightening. Ice cream must be richer, creamier and more decadent. Chocolates have to melt in the mouth producing a gorgeous layer you can scrape off with your tongue – if there is some praline or caramel in the mix, we pay double. Fruit smoothies are great, but add extra banana and ripe paw-paw to make them “tastier, more dessert-like”. Which begs me to ask why more people are not drinking the fantastic sweet wines South Africa makes? I’ve said it before: when it comes to cloying noble late harvest wines, unctuous Muscadels and bright Port-styled drinks, this country plays in the Super League. Yet these items of deliciousness struggle to make inroads in the market-place. Double Toffee Ice-Cream and super-thick praline chocolate, but just don’t put sweet in our wine. Leaving the making of these wines something of a labour of love. 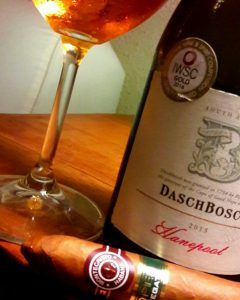 Daschbosch Hanepoot – deserves a Monte Cristo Cuban cigar. 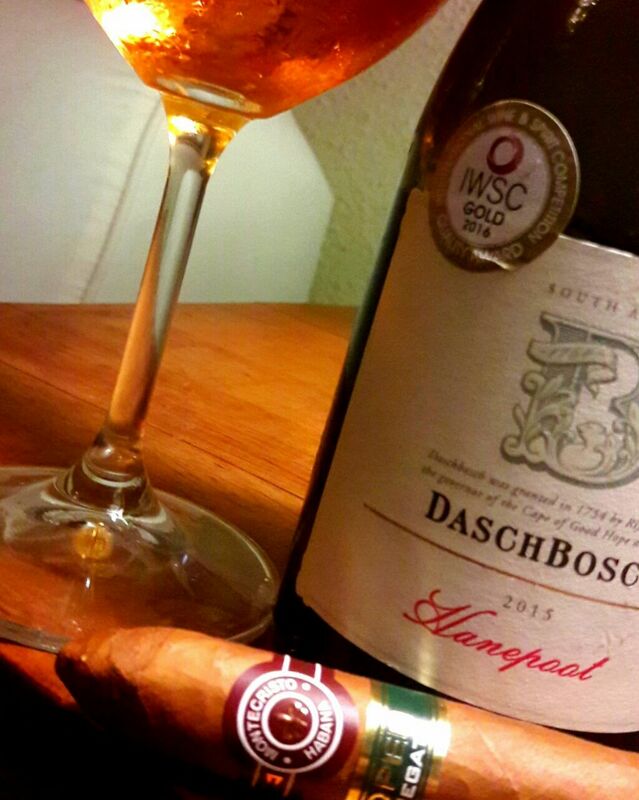 My latest vinous jewel of this variety was a Hanepoot from Daschbosch in the Breedekloof made from vines planted way back in 1882. Surprisingly, these old Muscat d’Alexandrie vines still bear some three tons a hectare. And that they’ve been around that long is a wonder, as many farmers have given-up on Hanepoot. It is a tasty grape making good eating, so when not stealing pipes, breaking pumps and pilfering any metal objects, land-invaders help themselves to the ripe Hanepoot bunches. This usually takes place in the dead-of-night when it is difficult to get a good shot in at the trespassers. But this old vineyard from 1882 has been spared, and uniWines’ vinifies and bottles its grapes to make for something quite remarkable. The bottle I had was from the 2015 vintage, and purely for experimental reasons as I am stashing the rest away for at least a decade. This is a sweet sucker, coming in at around 233 grams residual sugar. Despite the alcohol level of 16%, the wine underwent slight fortification to add a bit of woema, and the 5.8 acid provides a perky lift without making things too flirtatious. To the eye, this is burnt gold. The nose is curiously devoid of that typical Muscat perfume these wines tend to have, a fact that can be laid at the door of the age of the vines and the subsequent exceptional and overpowering fruit concentration. Slightly chilled, the Hanepoot hits the palate like melted honeycomb, slipping gently into the mouth the way an eel glides beneath a piece of coral. The romance behind the wine, the colour and the nine-month ageing in small barrels makes one expect leather and tobacco and those club-room Tawny Port things. Not to be. It is a pure fruit structure that has absorbed sun, the sweat of the ancient vine, the last summer nectar from the shrivelled grapes. There is a run of Turkish sultana, big and yellow and just out of the sun, before a cool line of burst apricot takes over, followed by a slice of hacked quince and late-season kumquat. The sultry sweetness is, as wines such as these should be, by no means over-powering. Brisk bits of grapefruit peel keeps the wine alive in the mouth, ending the long finish with a tang and a definite call for more. It is a wine expressing sunshine, loads of it. Then there is the character of gnarled, crude vines that should have been dead already, but are clutching to life to fulfil that request to provide just one more bit of joy and pleasure to man-kind. Such a lovely description Emile. A sunny sweet golden taste of paradise on a wintry cold gray and drizzly day.